Jennifer and Bob McNeill had their wedding at the Chateau Belleive on May 25, 2013. 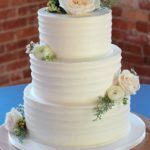 The cake design they chose was iced with ivory white chocolate fondant, with a intricate hand piped lace pattern on the top and bottom tier. 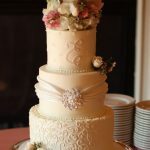 She wanted to incorporate their monogram so we put that on the middle tier. 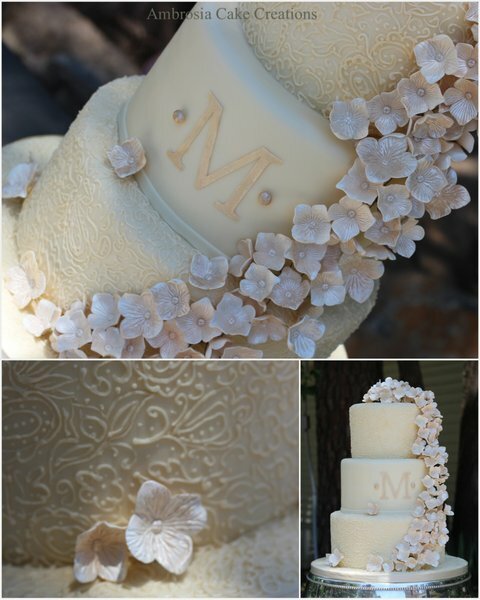 Their wedding cake was then finished with a pearl border on the bottom of each tier. The flowers were made of gumpaste and airbrushed with champagne coloring.